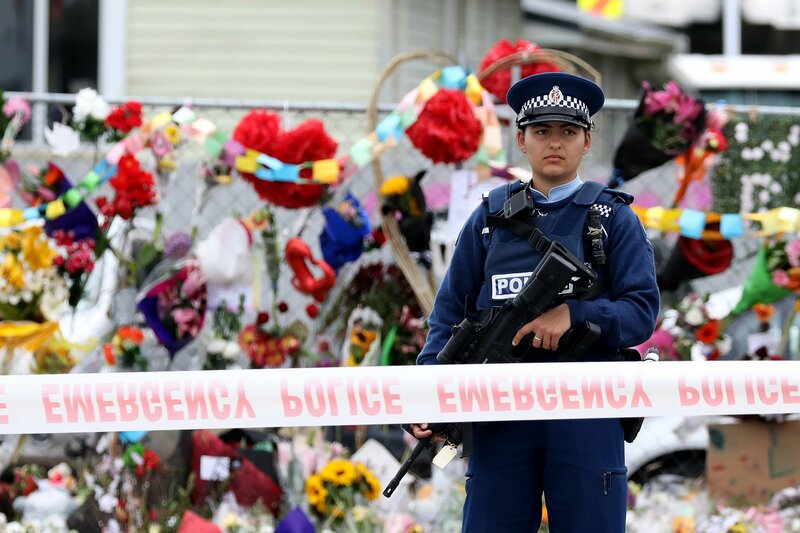 Just 26 days after the worst mass killing in New Zealand’s history, the country’s Parliament passed legislation putting tough restrictions on the possession of firearms. The legislation passed almost unanimously, with David Seymour, the leader of the center-right party Act, the only lawmaker to oppose the Arms Amendment Bill, which won approval on its third reading. The amendment bans military-style semiautomatic weapons (MSSAs) and parts that could be used to assemble prohibited firearms, with exemptions for pest control, collectors, heirlooms and mementos. A policewoman stands guard outside the Linwood Mosque in Christchurch, New Zealand, one of the scenes of the country’s worst ever terrorist attack, on March 21. The parliament has passed a gun law reform measure that would ban the use of military-style semiautomatics (MSSAs). Sanka Vidanagama/NurPhoto via Getty Images Possession of prohibited firearms could now mean a prison term of up to five years. “There have been very few occasions, Mr. Speaker, in my history when I have seen Parliament come together in this way. I cannot imagine circumstances where that is more necessary than it is now,” she said, according to Radio New Zealand. The bill is expected to receive its Royal Assent, which rubber stamps legislation, on Thursday and take effect by the following day, four weeks to the Friday that saw 50 people killed and dozens of others injured after a gunman targeted two mosques in the South Island city of Christchurch. His concern is shared by those unhappy at the speed of the introduction of the legislation. He said restrictions had already been put in place over the use of MSSAs that made the bill unnecessary. The government will buy back banned weapons in a scheme that it said could cost as much as $NZ200 million ($135 million). Gun safety spokesman Miles Anderson said the new law meant that farmers would not be able to shoot pests with their prohibited weapons, instead forcing them to use licensed subcontractors. New Zealand Deerstalkers Association spokesperson Bill O’Leary said: “People who are law-abiding gun owners have actually felt that they were coming under a degree and criticism. “I really hate that term that keeps getting tossed at us, ‘the gun lobby,'” he said, according to Radio New Zealand. Police Minister Stuart Nash said the country would take other steps to “make our country safer,” telling lawmakers that he did not want to stigmatize gun owners. “There are good people in all of our communities who will find themselves in possession of banned firearms, parts and magazines. “This is because we are changing the law, not because these people have done anything wrong,” Stuff reported him as saying.